Here are two of our "winter deer" enjoying some of the hundreds of apples local farmers dropped off here at the Mount over the past two months. They were way more than we could use so when we had done all we could I placed a couple dozen out at a time and was amazed at how fast (overnight) they would be gone. I caught this pair one day so I snapped a photo right through my bedroom window. Thank you local growers! 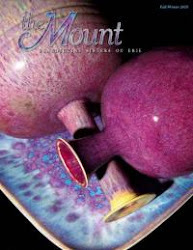 If you haven't had a chance to browse through the Fall/Winter issue of our Mount magazine, maybe now is your chance. It's a real beauty. Yours truly took the photos on page 27! The piece on the cover by Brother Thomas is just one in our collection of over 100 pieces. A few of the dark blue ones are on display throughout the monastery right now as appropriate environment for the Advent season. They are always so stunning.